COPPERAS COVE, TX (October 31, 2018)—Spiderman, Batman, Green Lantern, Aquaman, Superman—all are recognizable super heroes, each with his own special talents. But, they cannot compare to the amazing Omegaman! The real-life super hero visited Williams/Ledger Elementary, living his life’s dream to impress upon students to make the best choices in their lives. “Everything is possible if you work your hardest at whatever your goal is, big or small,” Omegaman told the 800-plus scholars that filled the assembly room. Students learned what bullying is and the different types of bullying in a way they could understand and comprehend. Omegaman challenged the students to be a H.E.R.O. – Helping Everyone Respect Others and sharing his anti-bullying message. Principal Marla Sullivan incorporated the Omegaman assembly in conjunction with National Red Ribbon Week. The superhero identity captured the students’ attention and helped them retain the anti-bullying message for the long term. "If we start being mean and rude when we are little, then it gets so much worse when we are teenagers and then adults. We have to be kind now,” 2nd grader Keyonna Dawson said. “Omegaman said that if someone is a bully now, we need to help them be kind when they are young so they aren't bigger bullies later." The Omegaman program provided Williams/Ledger with support materials before and after the presentation to reinforce the anti-bullying theme. Materials included posters, promotional materials, parent letters, follow up material, videos and activity worksheets. Second grader Eli Wagle really liked how Omegaman taught students not to be rude to other people. “If we are rude to people, they will be sad and we will get in trouble," the 7-year old said. Marc Wilkes who plays the role of Omegaman, created the program after seeing reports of bullying increase across the nation. Second grade teacher Eden Briscoe says the program profoundly impacted her students. 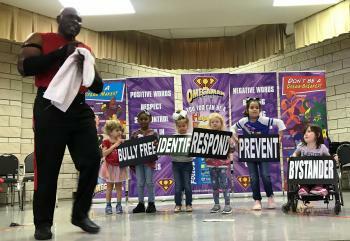 “Students were able to see this funny, strong male demonstrate kindness and application techniques for combating everyday struggles students encounter such as inclusion, being a leader, walking away from difficult situations, and simply being a good friend,” Briscoe said. Since 2008, Omegaman & Friends has visited over 6000 schools and presented in front of 1.​5 million youth in nearly all 50 states.